We see what we see. We imagine what we might see. We see patterns in how we might arrange colors, and so we assign names. We discover patterns within the patterns: we see abstractions We might somehow sense that there is much we do not see. It is very, very much. Hue - Sat. - Lum. Feynman's depiction of the protanope's 2-D projection from the 3-D of normal human color. Birds and insects see color we have (almost) no way to think about. It seems to everyone that what we see is just what's there. In about 1685, Isaac Newton discovered realms of vision beyond human vision. Since Newton, science has discovered much, much more that lies beyond human perception. Light is a bit like waves on water. Those water waves are a few feet apart. Light wave lengths are measured in millionths of a millimeter. Then, just what is color? It's Mother Nature's attempt to give us perception of wave-length distribution of light! at least of that tiny bit of the spectrum that we can see. The light that gets to our eyes is almost never of just one wavelength. It's a whole range of wavelengths, with more of some and less of others. This is a graph of the wave-length distribution of light that might be reaching our eyes just after sunset. That spike in the yellow is a bit of light from a sodium-vapor street light. Of course, we see none of this. Because our eyes aren't spectroscopes. Mother Nature didn't do a very good job when she designed our color vision. of bright-light sensors, very, very small and very, very many. Each kind of these "cones" samples a bit of the spectrum. One kind is most sensitive to light of about 450 millionths of a meter. One kind is most sensitive tol ight of about 550 millionths of a meter. One kind is most sensitive to light of about 580 millionths of a meter. of the information that would be given us if our eyes were spectroscopes. can help us ask and answer questions where our vision fails us. 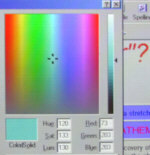 Colors order in three dimensions Colors order in two dimensions Colors order in one dimension. Color blindness can be of many other kinds. For example; deuteranopia is blue and red cones functioning. When normal human color vision sees this . . . ...protanopic vision sees this and blue-cone only vision sees this. What does a bird (with 4, 5, or 6, components of color vision) see? We have no way of seeing that with our eyes. What does a bee (with polarization vision) see? We have (almost) no way of seeing that with our eyes. we tend to be blind to so much of our world.